ALWAR: Sheodan Singh. Raja of Alwar (1845-1874). bl.uk > Online Gallery Home	> Online exhibitions	> Asia, Pacific and Africa Collections	> ALWAR: Sheodan Singh. Raja of Alwar (1845-1874). 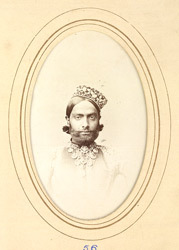 Portrait of Sheodan Singh (1845-1874), Raja of Alwar from the 'Album of cartes de visite portraits of Indian rulers and notables' taken by Bourne and Shepherd in the early 1870s. The Princely state of Alwar, in Rajasthan, was founded by the Maharaja Pratap Singh in the 18th Century by pushing back the Jats of Bharatpur. Maharaja Pratap Singh was from a branch of Kucchwaha Rajput clan which was the same as the Maharajas of Jaipur. Shedon Singh succeeded as a minor in 1857 and reigned from 1863 until his death in October 1874.